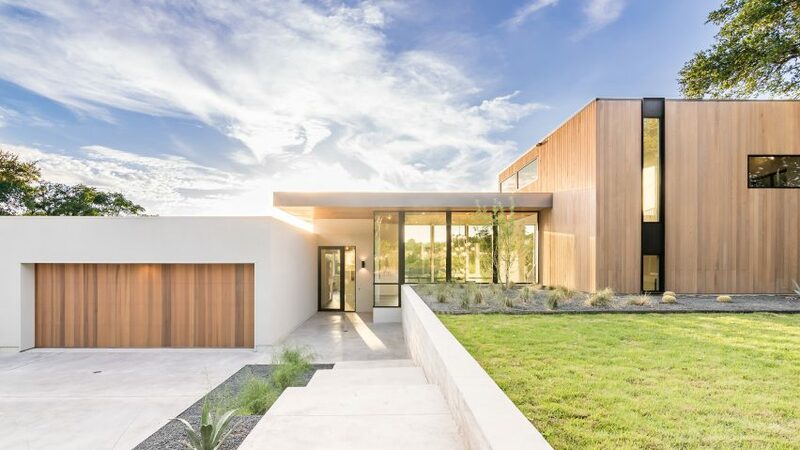 Cedar, concrete and stucco were among the materials used to construct this spacious Texas dwelling by American studio Matt Fajkus Architecture. 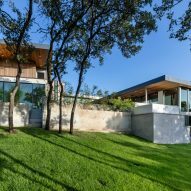 Called the [Bracketed Space] House, the residence is located on a sloped site in the city of Austin. It was designed for a young urban family that enjoys indoor-outdoor living. 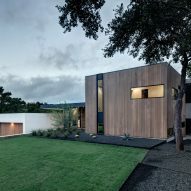 The two-storey home was conceived "as a meaningfully framed procession through the property with nuanced natural lighting throughout", said explained Matt Fajkus Architecture, a Texas studio founded in 2010. "The design intends to incorporate the site's dynamic landscape into the daily life of its residents," the studio added. 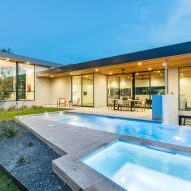 For the exterior cladding, the architect employed a range of materials, including cedar, natural stucco, steel and glass. Board-formed and cast-in-place concrete was also utilised. 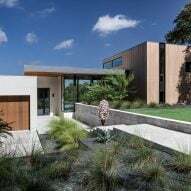 Totalling 4,849 square feet (450 square metres), the home consists of two rectilinear wings – one for public functions, the other for private rooms. 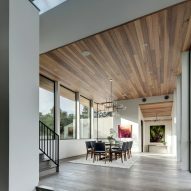 The wings are topped with flat roofs and are connected by a transparent volume, or "bridge", that enables clear sight lines between the front and rear of the home. The street-facing elevation features both horizontal and vertical elements. A concrete pathway leading to the entrance is bordered by a long retaining wall, which continues in the backyard. The home's interior spaces are oriented around an exterior courtyard. A spacious deck and slender infinity pool overlook a hilly, forested terrain, forming a "transitional space between man-made and nature". 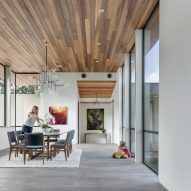 "All indoor spaces have connections to the outdoor, embracing the rolling hills and trees that surround the site," the architect said. 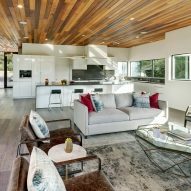 The home contains an open-plan kitchen and living room, a media room and several bedrooms. Rooms are defined by extensive glazing, stained oak flooring and ceilings sheathed in cedar. "A staircase acts as a vertical 'knuckle', mediating shifting wing angles while contrasting the predominant horizontality of the house," the architect added. 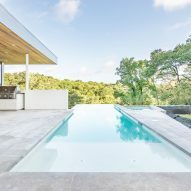 Other projects by Matt Fajkus Architecture include the Main Stay House in Austin, which features sliding glass walls that enable rooms to be fully open to the outdoors. Photography is by Charles Davis Smith, Spaces & Faces Photography.